The Top 100 Superyachts 2010 – Superyachts News, Luxury Yachts, Charter & Yachts for Sale. For the Top 100 Superyachts in 2010, there are only six new yachts in the world’s largest yacht list, down from the 15 mega yachts which joined the ranks in 2009. The 6 new superyachts in the top 100 list means the average length of the world’s largest 100 superyacht has increased around one meter to just over 84 meters ( 276’11”). The largest newly launched yacht in 2009 was the 360’10” (110m) motor yacht Dilbar and in 2008 the biggest new superyacht launched was M/Y Al Said at 508’6” (155m). Only time will tell if the world economic recession is to blame for the fewer entries this year, or if it will have a lasting impact on mega yachts being ordered or built. Some may argue that yachts launched this year were actually ordered a few years ago, and so if there was an economic downturn impact on new yacht orders and the size of yachts launched, this will manifest itself in two or three years time, rather than in 2010. Either way, it is well established that the yacht’s owners, which are some of the wealthiest individuals in the world, have lost money in the credit crisis along with everyone else. It should be noted that this list is ranked in terms of yacht length. There are of course other ways to measure a yacht’s size, such as weight, displacement or square meters of deck space, however length is the traditional, if somewhat flawed, measure of yacht size. It is important to note that the list doesn’t include luxury ‘mini cruise ships’ or yachts built exclusively for yacht charter, rather it focuses on private yachts. Superyachts in the second variety are noted at the end. Also, it should be noted that motor yacht Eclipse at 548′22″ (167.1) in length and owned by Roman Abramovich will be the largest when she is launched in late 2009. Motor yacht Dubai remains the largest private yacht ever built worldwide. The mega yacht’s unfinished hull arrived in Dubai where the superyacht in 2001. M/Y Dubai is a state yacht and she is owned by the ruler of the Emirate of Dubai and the Prime Minister of the United Arab Emirates – Sheikh Mohammed bin Rashid Al Maktoum. Previously owned by Prince Jefri Bolkiah of Brunei, Platinum Yachts FZCO of Dubai finished her steel hull and superstructure and managed the interior design and completed the interior and exterior outfitting of the yacht in 2006. The 68 year old Sultan of Oman, Bin Said Al-Said, who has ruled this independent oil producing country since 1970, is the owner of Al Said, which was ship was code named Project Sunflower during its construction. Oman’s economy is considered a successful model of moderate growth and diversification in the Middle East and well able to withstand the recession. M/Y Abdulaziz is Royal Saudi yacht which has a top speed of 22+ knots thanks to twin 15,382 hp, 12-cylinder Pielstick engines. With naval architecture by Maieform, M/Y Prince Abdulaziz is one of a couple of the Royal Yachts of the the Saudi Royal family. A 2007 refit in Montenegro updated the mega yacht, which was actually the world’s largest for 20 years. yacht. Nowadays, ENY Mahroussa is in the care of the Egyptian Navy. Deputy Prime Minister Sultan Bin Abdul Aziz Al Saud, Crown Prince of Saudi Arabia and chairman of Saudi Arabian Airlines owns Al Salamah – he is also the Saudi Arabian defense minister. At the time of the superyacht’s construction she was the second largest motor yacht in the world Twin 20 cylinder MTUs developing 8,056 hp each allow this displacement yacht, designed by Terence Disdale, to reach a 21 knot top speed. Only the British and Italian royal yachts were larger than Savarona when U.S. socialite Emily Roebling Cadwalader took delivery of her yacht. A large swimming pool, two Jacuzzis, two separate saunas and steam rooms, a fitness center and a floor heated turkish bath built from 260 tons of carved marble Turkish President Mustafa Kemal Atatürk then owned the vessel, which was later used by the Turkish Navy. Kahraman Sadikoglu, president of Istanbul’s Tuzla Shipyard, in 1989 signed a 49-year lease with the Turkish government and financed a three-year restoration project, which included a Donald Starkey interior and installation of modern diesel-electric engines. The Emir of Qatar, Sheik Hamad Bin Khalifa Al Thani, (Qatar’s Prime Minister and Foreign Minister) owns the graceful yacht, which owes her exterior styling to Tim Heywood. Qatar residents have a $94,000-year income per capita, and despite feeling a pinch from declining oil prices, the Emir told a German magazine that he plans for the country to continue investing abroad. Octopus sports two helicopters on her top deck and a 63 foot (19 m) tender docked in her transom. The megayacht also has a pool on board as well as two submarines. The well traveled yacht recently hosted billionaire fund manager and author George Soros. Paul Allen, co-founder of Microsoft, owns the Espen Oeino designed yacht, with an interior by Seattle-based Jonathan Quinn Barnett. The yacht has hybrid diesel-electric power. Allen is involved with philanthropy and his sports franchises. Designed by Philippe Starck, is without doubt the most idiosyncratic superyachts ever launched. Philippe Starck and Martin Francis collaborated on this strikingly innovative yacht built for 37 year old Russian entrepreneur Andrey Melnichenko. He has kept the yacht’s interior a well guarded private domain, but the designers alluded to large loft-like spaces and innovative furnishings, some mounted on revolving platforms. Superyacht “A” has a 23-knot top speed and cruising speed of 19.5 knots. The late Greek shipping tycoon Stavros Niarchos, made his fortune after WWII by creating a supertanker empire. Stavros Niarchos ordered the yacht reputedly as a replacement for a yacht he gave as a present to King Fahd of Saudi Arabia. The yacht Issham Al Baher was in Greece last year, under scaffolding erected for what seems to be a major refit. Stavros Niarchos commissioned Atlantis II from the Hellenic shipyard (part of Thyssenkrupp Marine Systems). Twin 12-cylinder, 4,800 hp Pielstick diesel engines power the yacht, which is equipped with a retractable swimming pool. Since he died in 1996, the yacht, which remains the property of the Niarchos family, rarely moves from her berth at the entrance of Monaco’s Hercule Harbor. Russian entrepreneur, superyacht collector and football team owner Roman Abramovich bought Pelorus back in 2003. The yacht has an exterior design by Tim Heywood and an interior by Terence Disdale. Disdale also worked on Abramovich’s yachts Ecstasea (No. 32) and Sussuro, a 160’ Feadship. A single joystick controls the yacht, which is powered by twin 3,600 hp Wärtsilä engines and has a 20 knot top speed. Ownership of the yacht is now sometimes connected with Abramovich’s ex-wife Irina. Owner Claus Kusch designed this yacht which is an innovation in environmentally friendly technologies. This includes sewage and waste water treatment plants, a water purification system and nitrogen and sulfur exhaust emission. Dilbar echoes in some ways Pelorus perhaps because Tim Heywood styled both superyachts. Alberto Pinto designed the interior of the yacht. Motor yacht Dilbar is understood to belong to metals magnate Alisher Usmanov, who also owns an Oceanco formerly named Dilbar. The Russian businessman owns “Kommersant”, one of Russia’s largest business publications and several social network sites as well as investments in steel producer Metalloinvest and Norilsk Nickel. Saudi billionaire Nasser Al-Rashid originally owned Lady Moura, once considered to be the most expensive yacht built. Although speedy, thanks to twin 6,858 hp diesel engines and controllable pitch propellers, the yacht seldom strays from Antibes or Monaco. Dr. Al-Rashid, of Rashid Engineering, is a Distinguished Alumnus of the University of Texas at Austin and his company has designed some of Saudi Arabia’s largest structures. refit that revived the vessel as Christina O.
in spite of a decline in retail sales Leslie Wexner still figures on Forbes list of billionaires. is fully equipped for business and available for charter. lights attracted attention all around the Caribbean. known as the Washington Companies. Paul Allen purchased Tatoosh, designed by Kusch Yacht and Studio 8, before ordering Octopus. winter only a few miles away from the Tampa stadium that hosted the Super Bowl. ongoing at the Blohm & Voss shipyard. 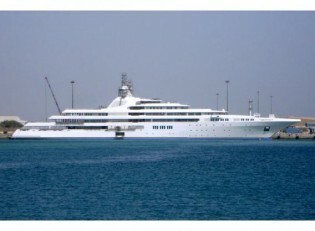 Mohammed Al Maktoum, reportedly uses the yacht. sold most of his Russian assets to invest in European banks. Claus Kusch reinvented the former icebreaker tug as a luxury expedition yacht with interiors by C.
2005, had been docked in French Polynesia for a few months. billion.) He is reportedly awaiting delivery of a new and much larger yacht Kingdom 5KR. next yacht(s), kept very much alive through the blogosphere, as projects Eclipse and Luna. spring launch was a very discreet affair and ownership is not independently verified. has been attributed to the Saudi Royal family. system and a secret passage to an escape mini-submarine. created a hydraulic system that elevates the pool floor to deck level where it becomes a helipad. in Monaco onboard Alfa Nero, which was identified then as his and wife Gianna’s private yacht. the U.S.-built support vessel Golden Shadow and the 98’ sport fisherman Golden Osprey. amateur oceanographer who founded the Khaled Bin Sultan Living Oceans Foundation. gross tonnage of 1,628, a maximum cruising speed of 16 knots and room for a crew of 54. MTU engines and ample fuel reserves allow the yacht to cruise 5,000 nm at 20 knots. builder, truly spectacular. Sheikh Abdullah Bin Khalifa Al Thani is understood to own the yacht. looks today. The yacht, which is available for charter, remains in the Getty family. thanks to twin 1,800 hp 10-cylinder Fairbanks Morse engines. Espen Oeino designed this stylish six-deck yacht with interior décor by François Zuretti. Latin America. The yacht is for sale for about $162 million. Belgium for a lengthy restoration. transatlantic yacht a 14-knot cruising speed. good standing who has listed his previous yacht for sale. the decor. The yacht has a 17-knot top speed and advanced sound and vibration features. baby-blue-hulled giant has not been revealed. fingertip maneuvering controls at the helm and impressive entertainment capabilities. yacht was renamed Lone Ranger and refit in Miami in 1997 in preparation for a circumnavigation. a small town. 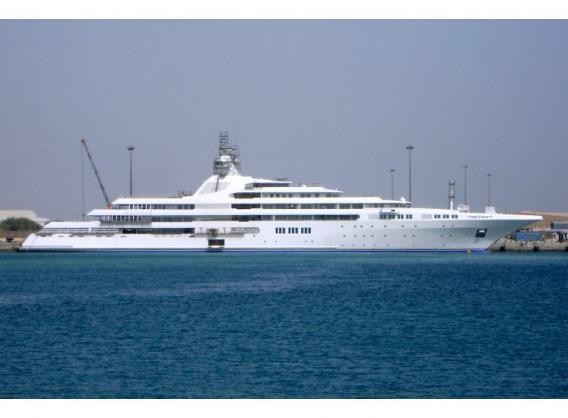 Motor yacht Tueq is said to be Saudi Prince Salman Bin Abdul Aziz’s private yacht. damages during WWII). Relief and rescue missions are part of the vessel’s official duties. understood to be Sheikh Ahmed Zaki Yamani, a long-time oil minister for Saudi Arabia and OPEC. the rainbow. Alberto Pinto and Laura Sessa designed the interior for a Russian owner. own the superyacht. He has important stakes in Russia’s largest mining company. venture he co-founded in 1948 and sold to U.S.-based Cendant in 1998.
derives revenues from a family-owned media company, which includes “The Daily Telegraph”. the yacht to a 30-knot maximum speed. The yacht’s range is 4,000 nm at 18 knots. malls after immigrating to Australia with nothing but a suitcase in the early 1950s. state rooms for 12 guests, a beach club and side doors to launch water toys. interior with space for 48 guests and 43 crewmembers. Her owner is from the Middle East. Espen Oeino designed this slender and swift yacht, the world’s longest aluminum motor yacht. state rooms. Silver is available for charter from the Indian Ocean to the South Pacific. Ships (MARPOL). The North American owners’ fortune stems from mining. Russian national acquired the yacht and withdrew it from the charter market. is said to belong to a little-known Russian copper tycoon, named Iskander Makhmudov. range of about 5,000 nm at 12 knots, Queen K is well equipped to travel the world’s oceans. 1,877 hp Caterpillar engines, the yacht can reach a maximum cruising speed of 17.4 knots. comes up in connection with the ownership of this yacht and previously the yacht Pelorus. the yacht’s attraction as a charter vessel. Legg Mason Capital is the owner. faucets,) although the yacht has been for sale for some time. made his fortune in cement, real estate and the media. recently returned from his second space trip, a fascinating but expensive destination. TV production king Reg Grundy named his yacht Boadicea after the queen of the Iceni Celts. cinema and a removable lawn for live-aboard dogs. Russian expat community in the United States. still ranks in the top 20 of Forbes’ list of billionaires in 2009.
has resurfaced as Nomad, available for charter and for sale again for $61.5 million. currently actively working on the refit of Attessa IV (No. 23). Pennsylvania, Jerome Fisher’s alma mater. yacht’s owner, a Midwest resident, is involved with the automotive industry. onto a spot on Forbes list of billionaires in 2009, thanks to a diversified asset portfolio. range with a maximum speed of 19.5 knots. very little is known about this discreet yacht, which owes its classic lines to John Munford. Twin Caterpillar 3516B DI-TA diesels provide a maximum speed of 16 knots. TB62 engines and a range of 4,250 nm at 15 knots. helipad, a garage and plenty of room for, sailboats, a race boat and all-terrain vehicles. of industrial equipment, has done very well in the current recession. of Lebanese descent reputedly owns the secretive yacht. decompression chamber and extensive diving equipment. Russian billionaire who derives his fortune from the steel and mining industries. which belies a modern and comfortable interior with such amenities as a sauna and cinema. is said to be the owner. diesels help Ona reach a top speed of 16.5 knots. yacht’s high-charter profile, Callisto’s owners have kept theirs quite low. extensively throughout the Greek islands. styling, while François Zuretti created an interior inspired by the classic cruise liner Normandie. seems that owner Hong Kong businessman Ambrous Young may be selling his yacht. self made international financier and a former deputy prime minister of Lebanon. slated to open in the fall inside the world’s largest tower.